Angus, my miniature schnauzer, now almost seven years old, came into my life just a few short months after the birth of his in a small town outside of Indianapolis. I grew up with Schnauzers, but never had one of my own since moving away to Boston, and then onto NYC. Although my heart ached for a dog with which to share my life, I instead filled the void through my years of school and career by volunteering at the ASPCA, where I was blessed with the opportunity to provide love, exercise, and socialization skills to countless stray dogs and cats rescued from unfortunate circumstances with the hope of a new chance at life. In 2002, my mother’s neighbor had a litter of puppies that needed homes. My mother knew the perfect place. The plan was that my mother would take a puppy home, care for him until he was old enough to endure the flight to the east coast, and then bring him to start his new life with me. What should have been a hop, skip and a jump, turned into a 12-hour day as delays on the ground postponed their flight’s arrival. As he has done every day since, Angus handled the unexpected like a champ with patience and grace. When my mother finally arrived at my door, my heart was bursting with anticipation. She opened a small ventilated case, no bigger than a makeup carry-on bag, and out he came – full of curiosity and love for life. No bigger than his favorite stuffed giraffe that made the trip with him, Angus fit in the palm of my hand. Since that first flight, Angus has traveled on countless flights with me and has always been the perfect passenger – well, with the exception of our first trip together… Angus was taking medication that day, which must have upset his stomach. Just a few minutes into a packed flight to Miami, Angus started to shake from head to toe. With the blessing of the passenger in the seat next to me, I took him out of his carry-on case and put him on my lap. He vomited three times, but each time, much to the pleasant surprise of the other passengers, I managed to avoid any mess by holding a sick bag under Angus’ mouth. Just when I thought the worst had passed, Angus had “projectile” diarrhea, which went all over me, the window and into the passenger’s luggage stored beneath my seat. I was mortified, but Angus looked at me with an expression in his eyes that I will never forget. Although he must still have not felt well, his only concern was that his accident had somehow disappointed me. Tears welled in my eyes and slowly descended down my face at that thought, and I had never loved Angus so much as I did at the moment. Angus sweetly licked the tears away and for the two of us, albeit not the other passengers, all was right in the world. Contrary to popular belief, I named him not after the steak, but rather after Angus Young of AC/DC (my little rock star). It wasn’t until later that I learned the meaning of the word – Celtic god of love and beauty. In all respects, Angus has truly lived up to the name and done it proud. A few years later, Angus and I were blessed by the addition of two more to our family. 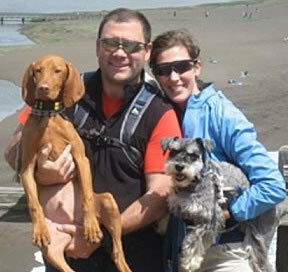 I married my husband, Robert, and shortly thereafter we brought home a four-month-old Vizsla. We named him Hampton, after the place where we met and fell in love. Angus took immediately to the role of “big” brother, and Hampton welcomed the guidance. They have been inseparable ever since. Like my husband, Hampton is of Hungarian origin and loves the outdoors and sports. As soon as our vet confirmed that his bones had formed well enough so that the impact of the city pavement would not cause damage to his young frame, Robert and Hampton hit the streets running. Angus and I, not being able to keep up, would walk and meet them on their return trip home. After miles of running, Robert and Hampton exhausted, we would all nap and enjoy the peaceful solitude together as a family.